Subscribers to Metro.net’s current email notification system have received notification to their inboxes of the proposed change. 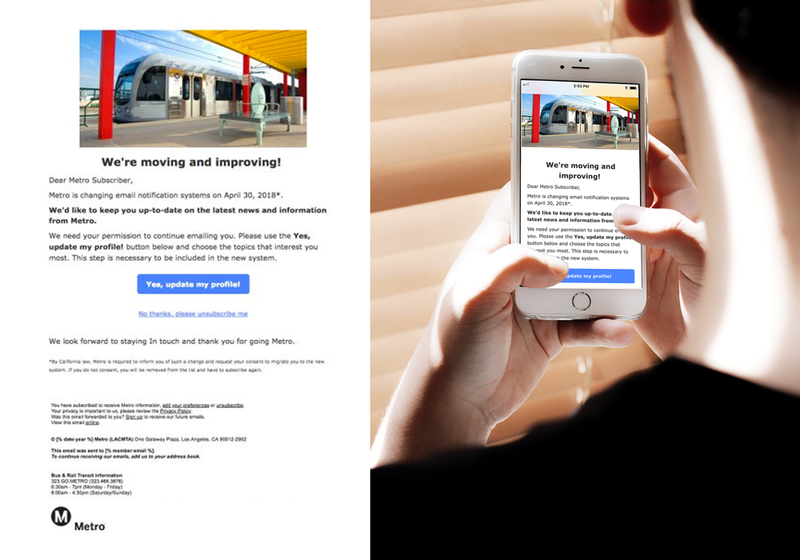 Subscribers are asked to ‘opt in’ to the new system in an effort to streamline Metro’s email notifications to its customers on a number of different topics including Projects, Destination Discounts, Metro Careers and Finance & Budget — just to name a few. Metro will send follow-up emails on April 13, April 20 and April 27 to make sure that all subscribers have the opportunity to opt in to the new system. Questions or concerns about the process? Please contact Metro Communications. If you haven’t already, sign up for email updates from Metro. Copy of Email sent to subscribers Friday, April 6th. Metro will send follow up emails on April 12, 19, and April 26 to ensure everyone has the opportunity to opt into the new system. How is the new Union Station platform for the Silver Line looking? Does Metro plan to allow cyclists to attend public meetings without forcing them to throw their toolkit in a trashcan? Metro should accept that using a bicycle as a means of transportation requires the use of a toolkit that has to be removed from the bicycle where it would otherwise be easily stolen. Allowing cyclists to store their bicycle specific luggage in a safe place would be a lot nicer than demanding that we put it in a trash can. Thank you for making a specific post about this email to help confirm it isn’t a phishing campaign.